As a result of long time researches and numerous experiments in several countries around the world, we proudly released MEGA G3. MEGA G3 is a second release of Mega Detection technology, a most powerful technology in the field of detection of gold treasures and precious metals and even diamonds. Mega G3 is a multi-purpose device, as it can detect gold, silver, bronze, copper, diamonds, gemstones and cavity. It includes two search systems, a powerful Long Range locator system, and new Ionic Scan system. Thus it is a perfect device for any serious treasure hunter and gold prospector. The second release of Mega Detection technology in Mega G3, was classified in first ranks globally by German and international organizations working in field of gold mining and metal detection. Mega G3 is versatile device. It has been developed exclusively to detect various kinds of metals, gold, diamonds and cavities underground, with powerful scanning features and reliable results. Mega G3 works using high-precision frequencies to identify all different kinds of metals in all terrain and soils types. Mega G3 has a simple easy-to-use multilingual graphical user interface that is available in 8 international languages. All components and parts of Mega G3 device are protected with sponge and placed inside high-quality waterproof bag. Mega G3 device incorporates a lot of smart and advanced technologies for detection of gold, precious metals, diamonds and cavities . Mega G3 includes second release of Mega Detection technology which detects buried targets signals by using special antennas designed exclusively to recive the weakest signals from buried targets. The most important feature of Mega G3 is the ease-of-use feature with ergonomic, comfortable design of the systembox, and its handle. 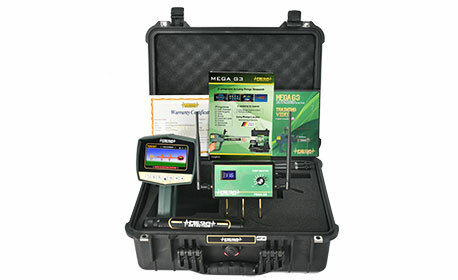 Mega G3 includes advanced long range locator system that has been devloped exclusively for this device by Mega Locators. It has high-accuracy built-in technology that receives emitted signals from gold and different types of metals, diamonds and gemstones using search antennas. The antennas are supported with additional signal boosting radar. The signal reception range starts from 250 meters and up to 2000 meters in the front range. In extreme depths, It is up to 40 meters in the ground. It has accurate determination of the size of the target and signal strength via a built-in analytical program in Mega G3 system. Mega G3 include a unique Ionic Scan system used to detect ionic radiations emitted from long time buried gold treasures and ancient artifacts in the ground. Mega G3 can detect emitted ionic fields radiations from long distances, using powerful Mini Sensor which recive radiations and convert it to an audio signal and display indicator on the screen.